"Ooga-Chaka Ooga-Ooga, I can't stop this feeling. Deep inside of me, girl, you just don't realize what you do to me when you hold me in your arms so tight…"
Those people who've ever watched the 2014 superhero blockbuster Guardians of The Galaxy will be beyond doubt familiar with Blue Swede's Hooked on a Feeling, a song from Awesome Mix Vol.1 compilation. Like Marvel's Guardians of The Galaxy flying high at the box office, the 70s-themed soundtrack follows suit, hitting the top spot on the Billboard 200 and iTunes chart. It was the second movie soundtrack this year to hit the charts, following the success of Disney's Frozen Let It Go. If you are curious about the album and want to join the Guardians of The Galaxy Soundtrack download bandwagon, here we've covered all about the GOTG soundtrack list and focused on how to free download Guardians of The Galaxy soundtrack, be it Hooked on a Feeling, I Want You Back or Ain't No Mountain High Enough from YouTube with a free Awesome Mix Vol.1 song video downloader. Among the singles in Awesome Mix, Blue Swede's Hooked on a Feeling climbed the Billboard Hot 100 upon its initial release. Statistics shows that the memorable "ooga chaka" chant sold more than 2,000 downloads the day after the preview premiered, up about 700% in daily sales, giving the tune its best digital sales week. So if you are hesitate about Hooked on a Feeling download, make a resolution and join in the Guardians of the Galaxy soundtrack download list. As the oldest song on 70s-heavy soundtrack to Guardians of the Galaxy, the song performed by Marvin Gaye and Tammi Terrell is always flaunted as one of the 1960's most enduring soul classics and has so far accumulated more than 28million views on YouTube. It is doomed to be one of the most captivating songs from Awesome Mix Vol.1 Album and worth a download for collection. The same as Hooked on a Feeling song, I Want You Back, played in the closing scenes of the GOTG, also reached a No.1 position on the Billboard Hot 100. The debut single by Jackson 5 showed Motown to the futuristic funk that was on the brink of replacing their brand of pop-soul. It also introduced the world to an extraordinary vocal talent Micheal Jackson, who was 11 years old when the song was released in late 1969. Remaining one of the hip-hop's favorite beats, B-Boy will never regret to download I Want You Back for collection. 1. 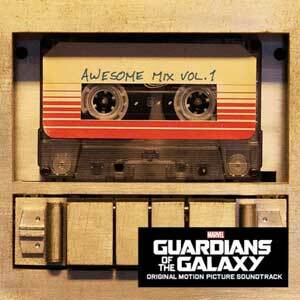 Simply preview, buy and download Guardians of The Galaxy: Awesome Mix Vol.1/2 from iTunes for $8.99. 2. Google Play offers a download of the Guardians of the Galaxy Soundtrack (Awesome Mix Vol. 1) for $3.99. 3. Go to Amazon to download guardians of the galaxy soundtrack MP3 version for $5. The 12 tracks can be easily obtained from the sources but please keep in mind they are all available for downloads at the cost of spending large amounts of money. For people wanting a Guardians of The Galaxy Soundtrack free download solution, it's undesirable. Does this mean an end to download these 70s-themed songs from GOTG at no cost? Absolutely not. You can easily get the Guardians of The Galaxy songs downloaded for free from YouTube with the aid of the best known yet 100% free MacX YouTube Downloader. Working as the best free Guardians of The Galaxy soundtrack downloader software, it allows you to freely download 12 songs from Awesome Mix Vol.1 album, including Hooked on a Feeling by Blue Swede, Moonage Daydream by David Bowie, Ain't No Mountain High Enough by Marvin Gaye, Cherry Bomb by The Runaways, and best hollywood bollywood soundtracks from YouTube, Facebook, Vimeo, Vevo, Dailymotion, etc. 300+ video audio sharing sites. What's more, it guarantees an adware-, malware-, spyware-free environment while letting you freely download these music videos, the Marvel's Guardians of Galaxy, as well as other funny YouTube videos in whatever resolution or format, be it the 4K videos, 1080P or 720p videos in MP4, WebM or FLV. Prior to the GOTG soundtrack download steps, you'd better have your guardians of the galaxy music video downloader downloaded and installed on your computer and find the GOTG songs from YouTube you'd like to download. Step 1: After you run this free Awesome Mix song video downloader, copy and paste the URL of the track on YouTube. Then just click "analyze" to load the tune's information. Or you can simply click "paste & analyze" button such that the program will automatically detect the YouTube video song. Tips: This free Guardians of the Galaxy song video downloader gives you the capability of automatically adding the output MP4 video to iTunes Library so that you can further import the song video into your iPhone or iPad for playback limitlessly. Step 4: Click "Download Now" to start the free Guardians of the Galaxy soundtrack download process. Optimal choice: MacX YouTube Downloader is optimal regarding to save the downloads of Guardians of the Galaxy soundtrack for preservation. But when it comes to playback of the album in a mobile way, its advanced edition MacX Video Converter Pro is second to none. With its awesome video downloading and converting abilities, you can easily download GOTG soundtrack Awesome Mix Vol.1 songs in MP3, MP4, MOV, AVI, WMV, etc and convert the downloaded songs of Guardians of the Galaxy to a wide range of devices, including iPhone XS/XR/X/8/6/Plus, iPad Air 2, Galaxy Note 4/Edge, etc with no effort.